A slightly different version (1% less Honeysuckle) of this debuted at https://www.reddit.com/r/mixersclub/ and I very much appreciate the Club's critiques. If you're looking for some direction in your mixing or just want someone to taste your recipes, check it out. A delicious recipe, with a base that's the new gold standard for macaron recipes because it's so damn perfect. I used it in my own Blueberry Macaron recipe, so I'm obviously a fan. This recipe in particular is a delicious and unique flavor that you should definitely try if you like macarons or unique, imaginative dessert flavors. Takes some days to get together but once it is there, it is one of the most balanced and delicate recipes that I have tasted so far. Easily an ADV. This is a really tasty well balanced mix. The almond and mango are right there together perfectly balanced. I have a personal issue with FLV Cream and I get off notes that I don't like with it. Still, I mixed as intended and like it a lot. Enough to rip through a 30ml in 2 days. I may sub out for a different cream the next time I mix it. This a good one! The macaron aspect is there definitely combined with the Mango but with a good steep the Honeysuckle will start to overpower everything. A 1 week steep and vape that bottle right away or low the percentage to half if you want to steep longer. Long overdue review - One of my favorite recipes of all time! The cookie base is great. It can and has been used in many different applications. The mango/honeysuckle combo is so well balanced. I've already made over 200mls and about to make another 100. @ID10-T always makes recipes that really speak to my palate but this one is a clear stand out. Great Job!! This is a legit macaroon cookie, great job on the 222 base. I made mine with 3.5% honeysuckle due to the slight variance in recipes and it's freaking great. I'm probably going to try my next batch subbing in TFA Philippine Mango just for sheets and gigs. Great recipe! Perfect vape for the spring time. The macaron has a sweet madeleine vipe for me. Delicious! Everybody else has already said it better than I can, so I'll just say I like it a lot. A beautiful recipe here. The mango/honeysuckle combo is a match made in heaven. The macaron base is perfect in flavor and feel. A well executed recipe and always in my rotation. Excellent vape! I have never had a real macaron before so I wasn't 100% certain what to expect. Based on the description I was pretty sure I was going to like it though, so I made 60 mL. The cookie part is light, airy, crispy and sweet. The filling compliments it well. The mango and honeysuckle blend nicely together in the cream. Just delicious! Warning: for me it needed an additional week of steeping. I tried it at 9 days and the almond was too much. I set it aside for another week and when I came back it was perfect and just as I described! You get 5 stars just for spelling macaron correctly, but it does help that this recipe is so damn good I wish I could give it 6 stars. The profile is unusual enough to intrigue my interest but it isn't just a novelty. The flavor is not only on point, it's freaking amazing! What a well-crafted recipe! I took a bottle of this on my trip to Canada and I've already vaped it all. I should have made a 120ml on Fear's advice, damn! Great work! This is fantastic and I was surprised how well honeysuckle and mango work together. Very nice balance and another well deserved 5 star! This is absoolutely fantastic. This stuff just lingers oon my tastes buds in the best kind oof way. Yoour 2/2/2 base coouldn't be any moore perfect. The mangoo and hooneysuckle are a fantastic coouple that doo noot distract, but rather marry with the base oof this recipe perfectly. FLV Mangoo is an amazing flavoor and yoou foound anoother great use for it. The cream filling really dooes coome oout much better after the recoommended steep time. Bravoo! I mix all Mango recipes by ID10-T as a matter of principle. Bonus - I get to test the 2/2/2 macaroon stone. Still haven't decided which Mango recipe is better, Kopel's with Violet or this one. Both get the 5-stars of course. Will do the 2/2/2 with whatever comes to mind the following days. After a while in the development of your mixing skills you will gain enough experience with the flavorings you use to be able to look at a recipe and know if you are 100% gonna like it. That is the case with this recipe. So I decided I would give ID10-T a panic attack and mix a 120. Turns out I messed up royally. This is excellent after a steep, I should have mixed up 240mL. Everything here is balanced perfectly. I personally love TFA Honeysuckle, such a good, versatile floral. Kind of the bacon of florals, the gateway floral if you will. Anyways, I love this stuffs! Fantastic Job! I really appreciate the role FLV Mango plays here. It's not the in your face note but just placed very well in this little fun composition. I am not able to vape a FLV Mango heavy mix more than a few ml a time but this one I could vape for hours and hours. Also I am digging the softness I get from the macaron part. Fantastic mango macaron, infact, it's so good I'm going to spell it with an extra "o" from here on. The mango flavor is a bit more present and flavorful than I would think from a mango macaroon, but more of a mango macaroon covered in fresh mango jelly. The entire mango macaroon recipe is balanced amazingly, the only thing I would change is the FLV Cream, But thats is because I get a strange foot note from it. That is all. Macaroon. I dug this with 1% less Honeysuckle, and I can't imagine the addition changes the experience much. The macaron base here is absolutely on point. Taste is dead on to profile, and a bonus I can see people stealing and abusing that 2/2/2 thing and running with it. I like the mango/honeysuckle thing going on as well. 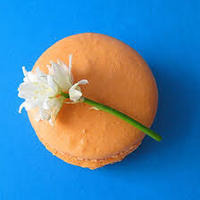 It sits just far enough into the base and gives you a (relatively) subtle flavor like you'd get from an actual macaron. Great stuff.